Two doctors staged a hunger strike in Parliament Square to protest the treatment of NHS whistleblowers on Friday. 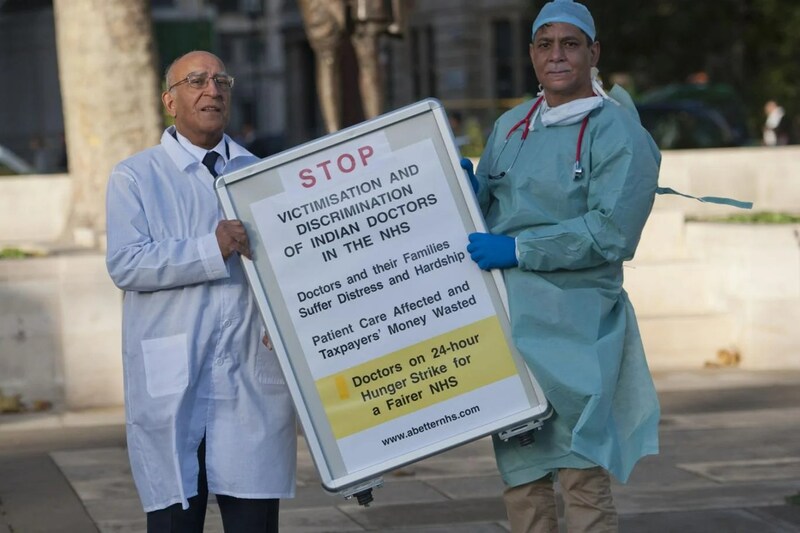 Dr Narinder Kapur, 66, and Dr Shiban Ahmed, 51, were demonstrating over “widespread victimisation” of doctors, particularly ethnic minority staff. The 24-hour hunger strike was due to coincide with the visit by Indian PM Narendra Modi. Dr Kapur, from Harrow, was sacked by Addenbrooke’s Hospital in Cambridge in 2010. He claimed this was because he blew the whistle over underqualified staff. A tribunal ruled he had been unfairly dismissed but he was not reinstated. He hopes Mr Modi “will raise with David Cameron the issue of discrimination of Indian doctors”. Dr Ahmed, a surgeon at University Hospital North Staffordshire, was one of the first to blow the whistle on wrongdoing at sister hospital Mid Staffs.